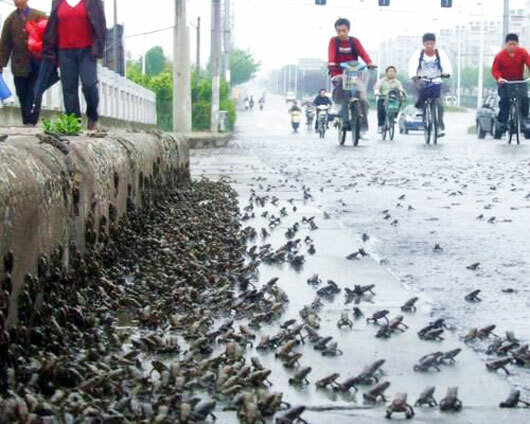 Thousands of toads were spotted on May 9 at a bridge in Taizhou, Jiangsu Province, China. According to local expert, the toads were enduring mass migration because of depleting oxygen resource in a nearby river. [Update] This story was first shared before the Sichuan earthquake on May 12. There are speculations that the mass migration was an omen. And the rumours heated up as similar sighting was spotted in Mianzhu, one of the quake affected areas, just a few days before the disaster struck. Personally, I don’t think the migrations and quake are related. The world is full of mysteries though, I am not sure despite scientific explanations. Regardless, what really matters now is to rescue the possible survivors and help with the relieve efforts. See what you can do OK? Did the toads predict the China earthquake?